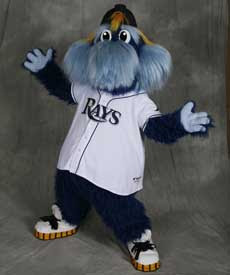 Let me introduce you to Raymond......"Ray"mond is the politically correct mascot for the Tampa Bay Rays. The Rays used to be the Devil Rays...but you can just guess how we got from point A to point B. Anyway, Raymond is ecstatic because his team, the Tampa Bay Rays, beat the Boston Red Sox to take the American League Pennant for the first time ever! Now they are pumped up about going head to head with the Philadelphia Phillies in the World Series, starting today. 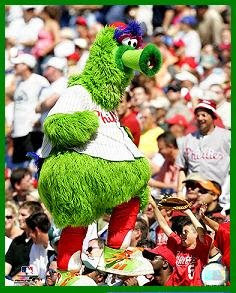 This is The Phillies Phanatic...the mascot of the Philadelphia Phillies. I don't have a clue what he really is, as in terms of an animal. He has a cylinder beak with a tongue that sticks out. The Phanatic replaced a pair of siblings dressed in 18th century garb named "Philadelphia Phil and Philadelphia Phillis". He is a legend as far as mascots go....right behind the San Diego Chicken. So, now that you have met the Mascots....Let the games begin! don't forget to vote in my World Series poll. I will keep the following schedule at the bottom of my posts until the series is over. The Phanatic is a bit creepy too. I love to see the underdogs do well. I think both of the mascots are wierd. I would have liked a devil MUCH better. I am partial to devils... I have to root for the Phillies since it is in my backyard : ) and I work in the town and my husband was born and raised in Philadelphia. Truth be told though, I could care less : ). I will be making a nice appetizer for all the men to eat tonight after Bible study is over while they watch the game. I am MOST excited about that : ). Suz, I agree, what was wrong with the Devil Rays! I would imagine there would be an issue with an Angel for a mascot since The California Angels have a Rally Monkey for a mascot. Yeah, I know they are officially called the Los Angeles Angels of Anaheim. Because the new owner loves LA, and the people in Orange County just don't feel the connection....bad blood there for sure. We have a wedding sat. night,,,,,bwahhhhhhh,,, wonder if they will have a tv there? 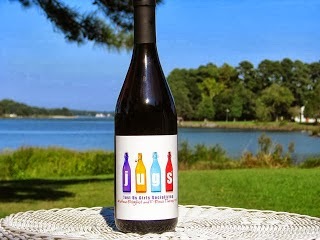 I know the mummers will be there ! that mascot looks a lot like Orbit (orbitz?) from the Albuquerque Isotopes. I am looking for that right now. Orbit is orange though, but he nose is oddly familiar! haha I thought you had kids with Fall Ball going on. The Philly Phanatic looks more like the Phillies Crack Addict. I heard on NRP tonight that the Tampa fans are sporting Rayhawks (mohawks). Should be interesting. I am watching TV as I read blogs...I can't just sit in front of the TV....it makes me feel like I am wasting time....but Go DEVIL Rays!